Home › Golden eagle › Bonelli's eagle - Aquila fasciata. The Bonelli's eagle (Aquila fasciata) belongs to the family Accipitridae. These Bonelli's eagle species are distributed in Africa, Indian subcontinent, Mediterranean region, the Middle East, Indochina, Southeast China and Indonesia. Aquila fasciata is closely related to A. spilogaster and A. verreauxii. It was earlier included in the genus Hieraaetus. The two recognized subspecies are: A. f. fasciata Vieillot, 1822 and A. f. renschi (Stresemann, 1932). The Bonelli's eagle is a medium sized bird of prey, measuring 65 to 70 cm in length and weighing 1,600 to 2,400 grams. The wingspan is 150 to 170 cm. The upper parts are dark brown, whereas the underside is white with dark streaks. The eyes and feet of the eagle are yellow. The wings are relatively short and rounded. The tail is long and is grey on the upper side and white below. There is a broad terminal black band on the tail. The call is a shrill 'klu-kluklu-kluee' sound. The Bonelli's eagle inhabits forest edges, cultivated land with large trees on the fringe, hilly areas and open country with some tree cover. The Bonelli's eagle feeds on medium sized birds and mammals. It also takes reptiles, frogs, insects and rarely, carrion. 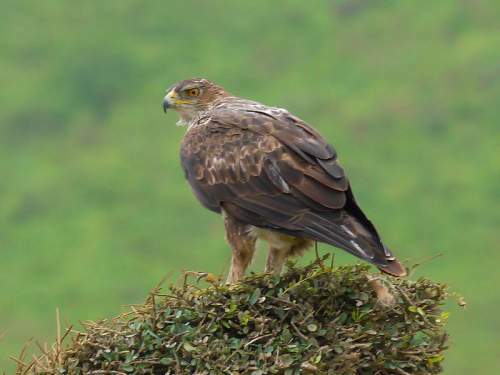 The Bonelli's eagle breeding season is from November to September in India. The nest is built with sticks and twigs on a remote cliff ledge or in a large tree. It lays 1-3 eggs. The Bonelli's eagle subspecies A. f. fasciata is distributed in Africa, Mediterranean region, Middle East, Arabia, Afghanistan, Indian subcontinent, North Indochina and Southeast China. The eagle subspecies A. f. renschi is distributed in Indonesia. The Bonelli's eagle is mostly sedentary and the juveniles birds disperse around the range. The Bonelli's eagle species have a very large range and are considered least vulnerable. However there is steady decline in the eagle populations. The decline in the prey population, human activities in the habitat, habitat degradation, use of pesticides, persecution and collisions with power lines are the major threats to the survival of these species of eagles. The IUCN (International Union for Conservation of Nature) has categorized and evaluated these eagle species and has listed them as of "Least Concern". Current topic in Birds of India: Bonelli's eagle - Aquila fasciata.